Kale belongs to a plant family that exhibits a high level of Glucosinolates (GSLs), which are responsible for defending against bacteria, fungus and insects. GSLs also have various human health-promoting properties. In particular, one type of GSLs called Glucoraphanin is responsible for the popularity of Kale amongst fanatics of healthy eating. This is because it can react with water to produce a potent anticancer compound. There are many interesting research articles on Kale. One that was published in the Journal of the Science of Food & Agriculture in 2013 compared leafy kale populations from Italy, Portugal, and Turkey for their bioactive compound contents. Research found that “Portuguese samples showed higher phenolic and GLS amounts than Italian and Turkish kales, whereas some of the Italian samples were the richest in carotenoids”. It is interesting that in order to utilise all the benefits of Kale we need to consume it crushed, as this is when all defence mechanisms are activated in the plant’s life. Rainbow trout for 5, or one Ocean trout. 1. Soak black rice in cold water for 10-24 hours. 2. In a deep dry pan heat cumin seeds until fragrant. 3. Add oil to the pan and sauté onion and garlic for a few minutes until fragrant. 4. Add rice and half of the stock, let it simmer until all of the stock is absorbed. Then repeat with the remaining stock. The rice should cook for about 30 minutes in total. If the rice wasn’t properly soaked, increase the amount of stock and cooking time to soften. 5. In the meantime, process kale with coconut milk and spices in the food processor. Continue until a consistent mixture is achieved. 6. Combine all ingredients and cook on low heat for 20 minutes or until the pudding can hold its form and rice is very soft. 7. Stuff the fish with kale pudding. Wrap in aluminium foil and BBQ for 3 minutes on each side and let it rest for 10 minutes. Alternatively, grill your favourite fish and serve with pudding. Cod, Mackerel or Sardines would be a good option for this recipe. 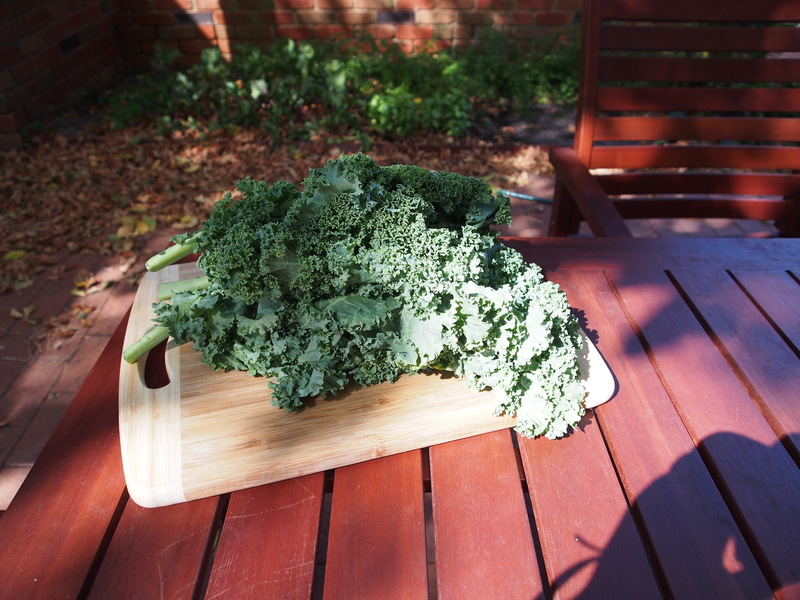 See ‘Why’ in the next post, there will be more interesting facts about Kale. Never thought I would enjoy eating kale 😉 . Keep it up. 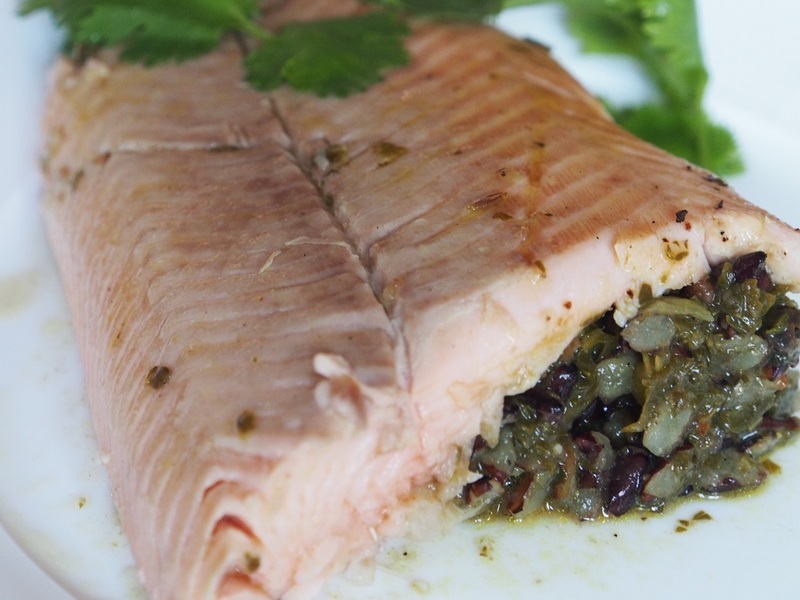 Have you ever tried cooking this recipe with other proteins instead of fish? Really enjoyed the strong taste of the pudding. Yes, but it was not a great success. I tried to top the pudding with grilled duck breast fillet. However, the pudding’s rich flavours overpowered the duck. I read that it is better to use iodine rich products with Kale, fish also has a stronger flavour. Watch out for my next post on Kale!